January 24 – The image of Egyptian football has taken another battering five months before hosting the Africa Cup of Nations in place of Cameroon. Egyptian club Ismaily has been thrown of the African Champions League after fans forced the abandonment of last Friday’s home fixture against Club Africain, the Confederation of African Football (CAF) has confirmed. 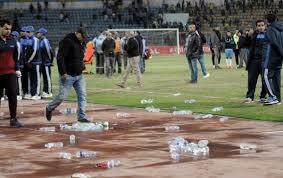 Ismaily fans threw stones and water bottles at match officials and the Tunisian club’s players, forcing Cameroon referee Neant Alioum to order the teams into the changing rooms in stoppage time. The visitors were leading 2-1 at the time. CAF expelled Ismaily from this season’s competition, having disqualified Algerian side Entente Sportive de Setif after similar scenes in a match against Mamelodi Sundowns in 2016. Ismaily’s results in Group C have been annulled, leaving Algerians CS Constantine top with six points from two games. Egypt were recently controversially named as replacement hosts of the 2019 African Nations Cup in spite of a number of incidents involving unruly fans in recent years. The worst tragedy occurred when 74 people, most supporters of hugely popular Cairo club Al Ahly, were killed in clashes in Port Said seven years ago.